I got word at JD's Inaugural that Rick Rodriguez had an event going on at Monte Christo. Rodriguez was one of the candidates that I interviewed back in the primaries, so I wanted to catch his event. It was the swearing in on two judges, it turns out, Ricardo Rodriguez and Mary Alice Palacios. I only had my camera phone, so my pics are good enough for a blog, but far from award-winning. I had ran into Don Medina at UTPA earlier, but didn't get a picture of him. He's sporting a new look. I didn't recognize him at first, but you can't forget his personality. He's the friendliest guy you'll ever meet. I did get a chance to meet and shake Judge Rodriguez's hand. There was a long line of people waiting to meet him. To me, that's a good sign of an elected official, that people want to meet him. There were other people present. I forgot to mention in the previous post that Rep. Veronica Gonzalez was at the Salinas Inaugural. She attended Judge Rodriguez's as well. 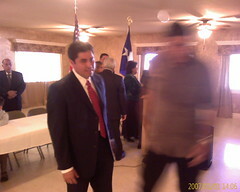 Congressman Kika de la Garza was also present. I also got to see Laura Hinojosa. I had not seen her since the end of the primaries. 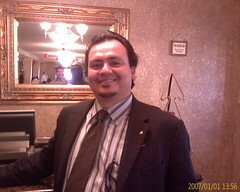 Edinburg's former Mayor Richard Garcia was the MC of this event. This sort of thing is exciting, to meet some of the people who will make our local government work in 2007. I think it will be a good year. I hope everybody does their best to bring honor to the Rio Grande Valley. The RGV is gaining importance with respect to the rest of Texas. I hope that this year's incoming officials are able to take us to where we should be as a region.